Nearly 141 years ago, a group of Methodists gathered to discuss choosing a site for a summer camp "for intellectual and scientific culture and the promotion of the cause of religion and morality." That "camp" still exists today in the community of Bay View, just outside of Petoskey. 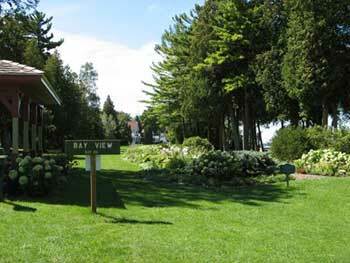 Founded in 1875, Bay View is a National Historic Landmark community complete with more than 30 community-owned buildings, nearly 450 cottages and two inns situated on 337 terraced acres. This location along Little Traverse Bay was chosen for its easy access to steamers and trains along with the gentle summer climate. Several hundred campers came for the first gathering in 1876 and by 1877, streets, park, and public areas were planned and 20 cottages had been built. The first building erected on the grounds was the preaching stand which is now part of the Bay View Historical Museum. By the late 1880s, more than 125 cottages, a hotel and a chapel awaited the summer campers. The chautauqua-like program lasted eight weeks and brought people from around the country. The Bay View Reading Circle was formed in 1893 and this simple organization had 25,000 members. Over the years, many nationally known speakers have taken part in the Summer Assembly such as Helen Keller, temperance leader Frances Willard, William Jennings Bryan, and Booker T. Washington. The voices that have filled the opera and concert halls over the years have entertained and educated thousands of summer guests. Today, much summers for the past nearly 14 decades, the Summer Assembly program, which is open to the public, brings together artists and students of the Conservatory of Music, activities of the Theatre Arts Department and the popular Sunday vesper concerts and Wednesday festival concerts. Throughout the summer, Bay View seminars offer instructions in everything from knitting to fine art. A youth social program has its own recreation building on the beach and includes activities ranging from hot dog roasts to movies to sailing to swimming. The campus club still maintains the shuffleboard and bowling on the green activities that have been a part of Bay View summers for many years. The Bay View Women's Council holds weekly meetings and programs and the garden club maintains flower beds, boxes, and baskets throughout the community. 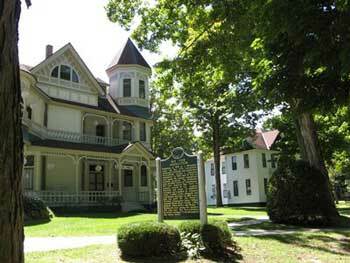 The Bay View Library is often known as the best summer colony library in the U.S. The Bay View Historical Museum occupies two historic buildings and is filled with information on the early days of the community. The architecture in Bay View is some of the finest of the Victorian era. The "cottages" with their gingerbread trim are testaments to the builders of the late 1880s. Each summer as Bay View residents--some a part of the sixth generation of family members summering here--gather and greet old and new friends, the sound of music entertains them as students rehearse and concerts come to life. Bay View is just as vital today as it was in the late 1880s with history, tradition, music, education, and architecture all coming together for the eight weeks of the "Summer Assembly" that means so much to residents and visitors.